Our fleet offers geotechnical capabilities for drilling projects in urban or remote locations. Each unit is equipped with geotechnical specific tooling including; hollow stem augers, split spoons, SPT hammers, dynamic cones with a variety of tools that can be supplied additionally upon request. Our geo-drills are outfitted with SPT auto-drop hammers to ensure our clients safety requirements are exceeded on every site. We are actively involved in the completion of upstream oil and gas and commercial Phase II & III Environmental Site Assessments across Western Canada. We also offer unique equipment that is applicable with commercial Phase II ESA drilling equipment upon request. Our fleet uses 6" solid stem augers for drilling, or for discrete sampling options we offer split barrel coring tubes for your sampling needs. We have always been committed to environmental awareness and operate upgraded equipment to minimize potential environmental impact. Only vegetable-grade, non-toxic, biodegradable hydraulic oil is used in our drilling equipment. Core Drilling has added equipment and tooling to handle the growing need for ODEX drilling. A specialized downhole air hammer bit is designed to be used inside casing and at the bottom of the hole. The downhole hammer drill has an eccentric reamer bit that opens up to a larger diameter than the steel casing. This creates an annulus larger than the casing during the casing advancement. During this method, the downhole hammer pulverizes the material below the casing and then, using the air pressure of a large 200 psi compressor, blows it back through the casing to the top of the hole. As the hammer drives through the material, it also contacts an internal shoulder machined into the casing shoe (base) which drives the casing down the hole as the downhole hammer drill is advanced. This method is well suited for drilling through difficult formations such as gravel, cobble and back fill. Sampling of returned materials is generally taken from a diverter T which is attached to the top of the casing during active drilling. ​Core Drilling offers diamond coring tooling in both NQ and HQ sizes. 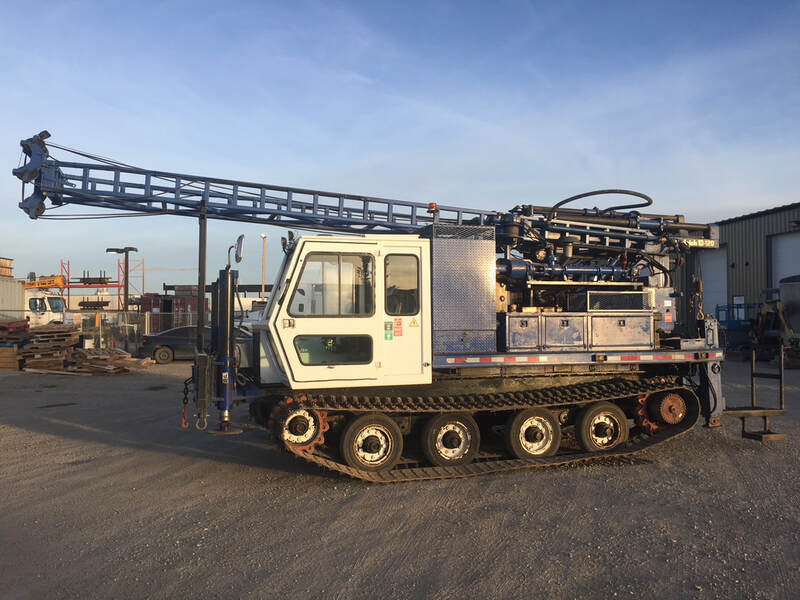 Coring for geotechnical drilling programs can be offered on both truck mounted drilling units or low ground pressure track mounted drilling units. Support equipment for the coring drills includes; track mounted flat deck carriers, heated water tanks, services trucks and air compressors as required. Samples are recovered from the bottom of the hole using a split barrel sleeve that keeps the core intact. ​Air rotary drilling is offered with all drill units. Our system can be used in an open-hole or cased-hole system to complete boreholes to the target depth. In air hammer drilling, compressed air is pumped through the NWJ drill pipe to an air hammer bit in the borehole. The pneumatic bit strikes the rock very rapidly. During drilling the pipe string is rotated by the drilling rig to aid in keeping the borehole straight. The compressed air that escapes at the bottom of the air hammer carries the pulverized cuttings to the surface. Air hammer drilling is very rapid, in even the hardest materials. It is the most commonly used method in hard bedrock areas of the province. 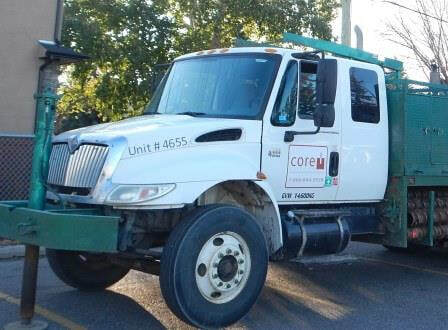 Core Drilling offers Cone Penetration Testing (CPT) and geophysical testing equipment in combination with our engineering partners in the industry. CPT is a process whereby soil characteristics are determined when a cone penetrometer is driven into the subsurface and data is collected on a laptop that is connected to the CPT tooling downhole. The CPT provides a rapid, reliable and economical means of determining soil stratigraphy, relative density, strength and hydrogeologic information (static and dynamic pore pressure, hydraulic conductivity).